The Crossroads of the World looks more like a city dump these days, thanks to those new pedestrian plazas. 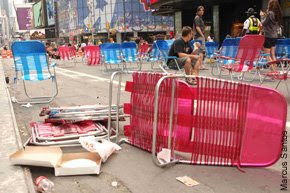 The cheapo tables and chairs set up in the pedestrian-only sections of Times Square have become a magnet for nightcrawler slobs who carelessly toss hot-dog wrappers, empty soda bottles and McDonald's bags on the street. "Especially speaking of weekends, like Saturday and Sunday morning, it looks like a bomb hit," said Tim Tompkins, the president of Times Square Alliance, the group responsible for keeping the plazas clean. Officials said they were caught off-guard by the crowds drawn to the newly car-free section of Broadway, and that the trash is one of the growing pains of the setup. On Saturday night, the Department of Sanitation was called in to do an additional garbage-truck run just to clean out overflowing trash cans, Tompkins said. The alliance, which gets its funding from business owners to keep the area spruced up, is revamping its cleaning staff's hours to fill a late-night gap in service from 10 p.m. to 5:30 a.m. Starting next week, there will be sweepers and garbage collectors on a new 10 p.m. to 2 a.m. shift, Tompkins said. "Part of it is, we don't have enough trash cans out. Got a bunch of extra cans from Sanitation, but they're overflowing. We're getting more," Tompkins said. Yesterday's early-morning mess was mostly the work of crowds that gathered at Duffy Square on Sunday night to watch the Tony Awards on big-screen TVs, officials said. Business owners said they've seen more trash on the streets in the morning. "It's starting to be more messy since the plazas came," said Akram Awad, a manager at Roxy Delicatessen. Tompkins said the mess was likely the work of residents. "I think tourists sometimes clean up better than New Yorkers do," he said. But some city dwellers balked at the notion. "It's tourists. They like to sit out here, but they don't like to clean anything up," said Jason Cruz, 30, from Brooklyn. Now's your chance to text a thumbs-up -- or -down -- when reviewing the new plazas. A marketing company yesterday unveiled a Times Square billboard that asks people, "Are you happy with the new Broadway?" and tells them to text "Love it" or "Hate it" to its number.